I have been a Johnny Depp fan since Edward Scissorhands! I was so excited to see he was doing another spooky type of movie this year. Just in time for Halloween his newest movie Dark Shadows is available in stores on Oct. 2nd. 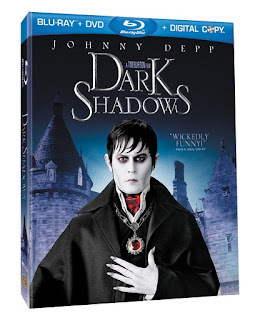 To celebrate the release of the new Johnny Depp movie Dark Shadows I am hosting a giveaway of the Blu-Ray combo pack! *Limited to US residents 18 years old and above. Giveaway starts Oct. 1, 2012 and ends on Oct. 13, 2012 at 12:01 am EST. Winner will be emailed and has 72 hours to respond before another winner is selected. I was not paid for this giveaway or post. The opinions on this item are 100% mine and may vary from others. The sponsor is responsible for providing the prize. Warner Bros. supplied these materials used in this post.